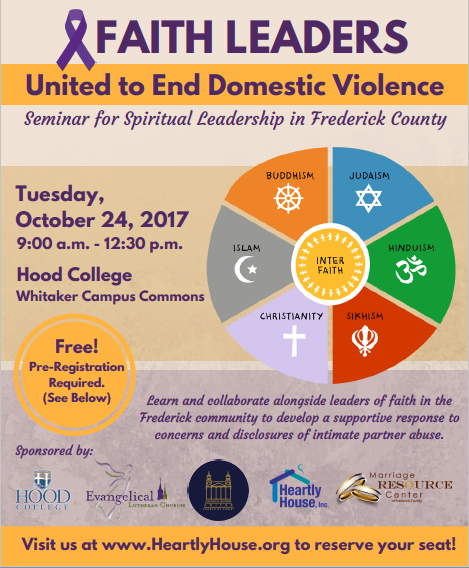 Heartly House, in partnership with Hood College, The Marriage Resource Center, Evangelical United Reformed Church of Christ, and Evangelical Lutheran Church invite spiritual leadership to attend the first Faith Leaders: United to End Domestic Violence Seminar. Learn and collaborate alongside leaders of faith in the Frederick community to develop a supportive response to concerns and disclosures of intimate partner abuse. Attendees do not need to be ordained; All persons interested in making change in their faith community are welcome! Defining intimate partner abuse and how to identify it. Common myths and misconceptions about intimate partner abuse. Examining various responses to domestic violence and the importance of an informed faith response. Proactive approaches to violence prevention in communities of faith. Local referrals and resources for survivors of intimate partner abuse. For additional questions, contact Nina Carr, Outreach Coordinator, at ncarr@heartlyhouse.org or 301-418-6610 ext. 231.